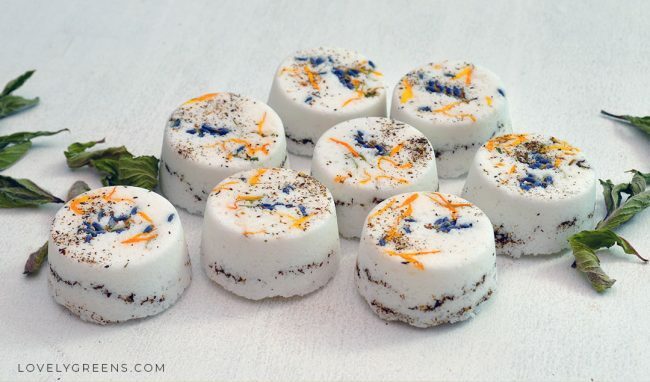 These natural herbal bath bombs are made with a beautifully scented blend of sweet herbal oils. 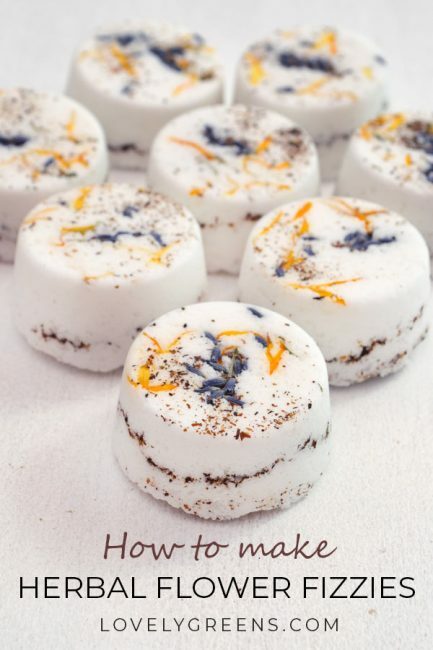 They’re uplifting yet soothing and the extra dash of calendula infused oil and epsom salts make them great for your skin. The ingredients you’ll use are pure and natural and making the fizzies is super easy. Best of all, if you grow some of the herbs yourself, you can use your own dried lavender, peppermint, and calendula to decorate. 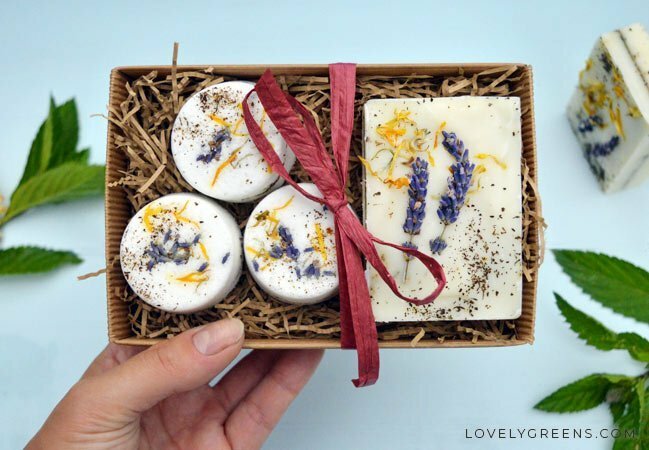 A sweet and natural way to use homegrown herbs to make natural beauty gifts. This recipe also has a matching soap that you can make too! Pair them together and you have beautiful natural gifts handmade by you. 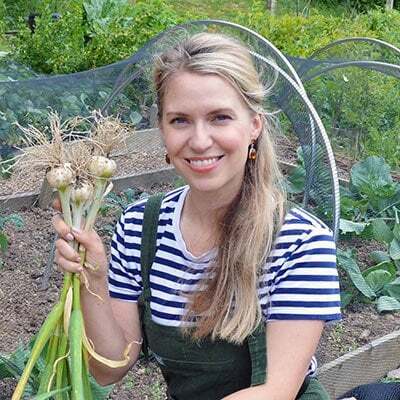 The four herbs I chose for this recipe have benefits for both the mind and your skin. Lavender essential oil is soothing and gentle and smells intensely floral. Peppermint has that natural zingy menthol that will make your skin tingle pleasantly. Marjoram is a sweet herb related to oregano and its oil is calming and sweetly herbal. Finally, calendula is a gentle skin herb and the teaspoon of oil in this recipe will moisturise, nourish, and heal. When you make these fizzies, the herbal oils are blended into a base that fizzes on contact with water. 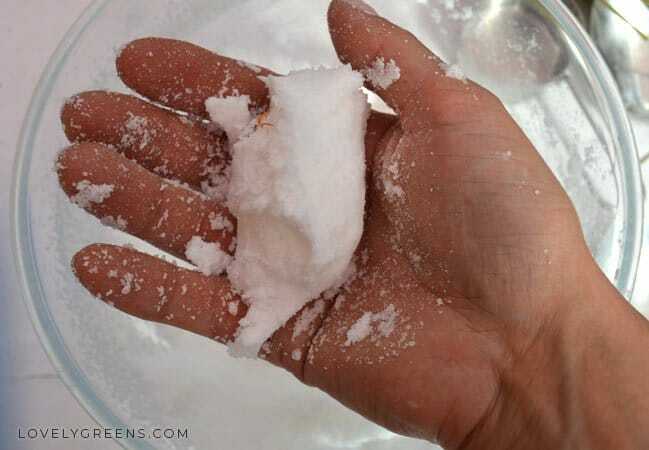 That base also has epsom salts that nourish you from the outside in with its magnesium content. All in all, these are wonderfully indulgent yet therapeutic natural bath bombs that the whole family will love. I’ve created this recipe to be both natural and very easy to make. The trouble with making bath bombs is getting them the right consistency — too dry and they won’t hold form and too wet and they get stuck in the mould. That’s why you’ll be using a silicone mini muffin tray to make these fizzies. They’ll pop out easily and make creating bath bombs stress-free. 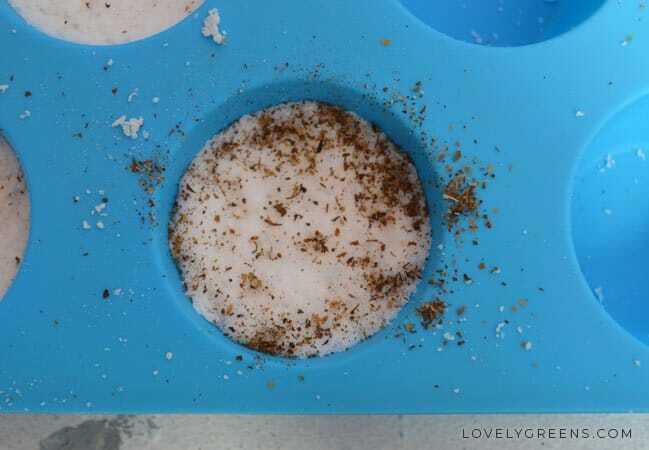 You can use two-piece bath bomb moulds for this recipe too but they’re a lot more tricky to master. You can purchase your calendula infused oil ready made or you can make it yourself. It’s simply dried calendula flower petals that have been left to seep in a light oil such as almond, sunflower, or olive oil. For more information on making it, head over here for the recipe and instructions. 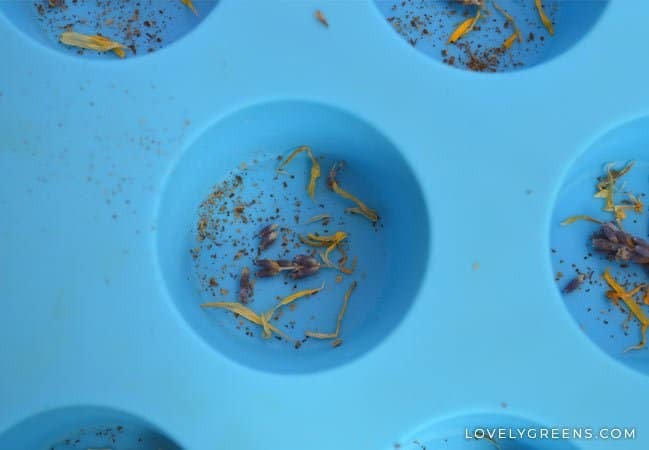 In preparation, decorate the bottoms of each cavity of the mould with a scattering of dried herbs and flowers. These will be visible on the tops of your fizzies. 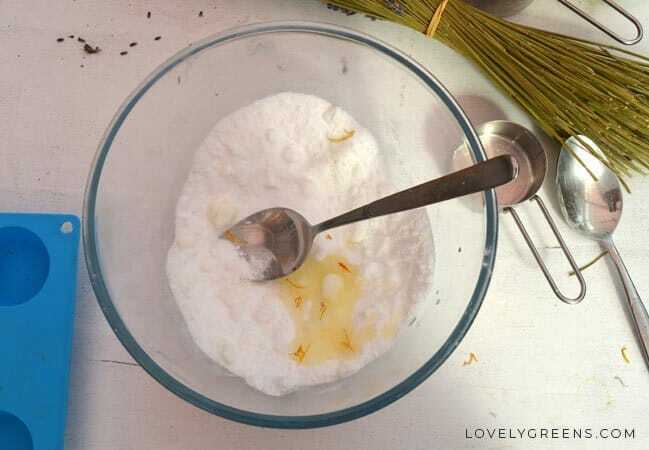 Place the baking soda, citric acid, and epsom salts in a bowl and whisk together. Spray the mixture with a couple pumps of witch hazel and stir. Continue spraying and stirring until the mixture is the right consistency. 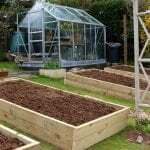 The consistency should be like lightly damp sand. Not too wet but just enough to hold form when you squeeze it together in your hand. The next part is all about artistry and you can customise it to however you’d like. The first bits of dried herbs and flowers should already be in the mould cavities — less is more when decorating the tops. Spoon about a Tablespoon of your bath bomb mixture into each cavity. Press down slightly. With your fingers, scatter a layer of dried peppermint on top, especially around the edges. This will create the line along the sides of the fizzies. Spoon another Tablespoon of the fizzy mixture on top and then press the whole thing down with your fingers. Press as hard as you’d like without leaving finger indents. If the mixture starts fizzing up at all that means it’s a little too wet. You can press it down with the back of a spoon but it may need this doing several times before it sticks. Now leave to harden for 24 hours. After you’ve waited that day, you can safely pop the fizzies out of the mould. 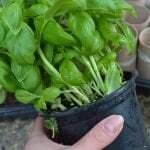 Store them in a water-tight container or use them right away — it’s up to you. 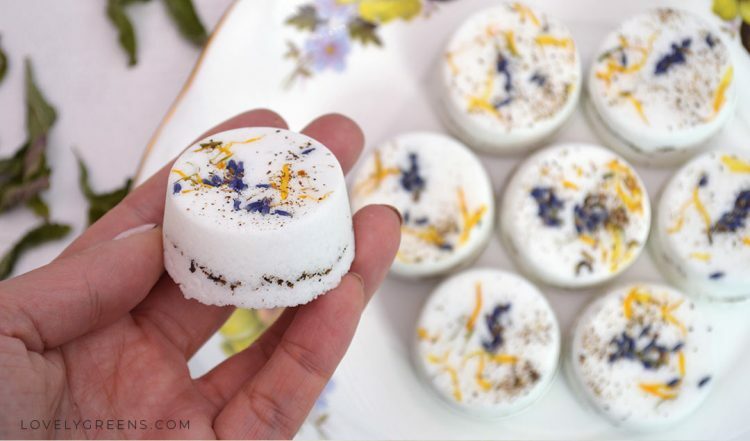 These natural bath bombs have a shelf-life of about one year or the closest best by date that you can find on the individual ingredients you used. Hello. Do you happen to sell the ingredients needed to make the bath bombs? I would love to make that purchase. If not, where did you get your ingredients from? There should be links within the recipe to help, Najla. I don’t sell the ingredients direct though. WI enjoy making bath bombs so I will try this way.